The list below is for the weeks of March 11- April 12. Results last updated on Friday, April 12, 2019. For more up-to-date results try the daily 'pdf' files. 7.14 Emily Dawidowich 12 Manitowoc Lincoln [HHT] 03/15 Raider Invite @ Sheboygan So. 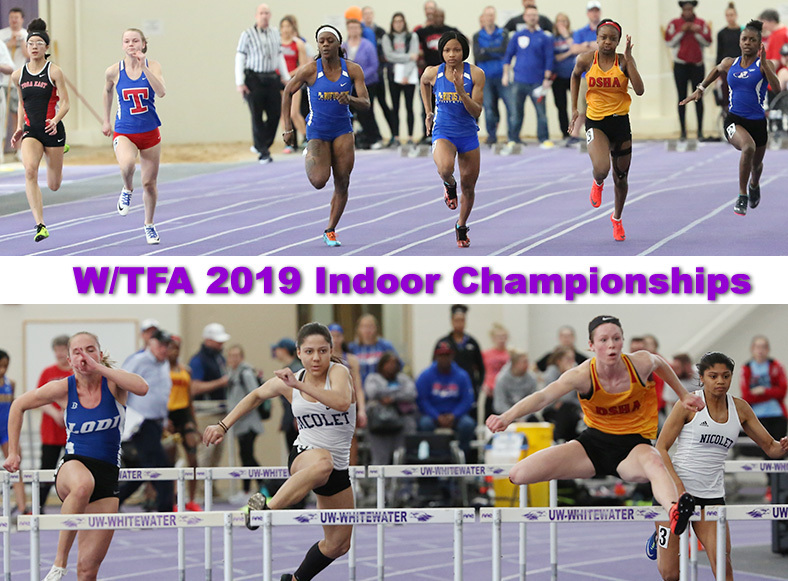 7.46 Alicia Jones 12 Kenosha Indian Trail 04/02 Kenosha Cnty @ Carthage Col.
09.13 Ellyse Wolfrath 10 Fox Valley Lutheran 03/26 Oshkosh [SM] Inv @ UW-Osh. 09.24 Kacey Topp 12 Freedom 03/26 Oshkosh [SM] Inv @ UW-Osh. 09.50 Rebekah Salfer 12 Shoreland Lutheran 04/02 Kenosha Cnty @ Carthage Col.
09.67 Lily Kabat 12 Notre Dame Academy [prelims] 03/26 Oshkosh [SM] Inv @ UW-Osh. 09.74 Caitlin Kravick 10 Kiel [HHT] 03/15 Raider Invite at Sheboygan So. 7.44 Delaney Mcfadden 10 Ozaukee [HHT] [prelims] 03/15 Raider Invite at Sheboygan So. 7.73 Brinley Wood 12 Cuba City 03/26 Pioneer HS Meet @ UW-Platt. 09.73 Laney Halbach 9 Hilbert/Stockbridge 03/21 Brillion Indoor @ Ripon Col.
09.74 Ciara Ewald 9 Mishicot [HHT] 03/15 Raider Invite at Sheboygan So. The Honor Roll uses the same procedure that the WIAA uses to convert Hand Held Times from Regional competition to a time that can be used to seed a Sectional competition. A HHT time is rounded UP to the higher tenth and then the time has .24 added. The National Federation handbook states that when converting hand times to FAT to round up to the nearest tenth, and then to add .24. The times for mile races and races in yards are converted using conversion factors from the The Big Gold Book by the editors of Track and Field News. The Honor Roll uses conversion tables from the 'Big Green Book' from the editors of Track and Field News to change times from races in yards or miles to metric equivalents. HHT times are indicated by HHT [Adjusted by converting hand times to FAT - round up to the higher tenth, and then to add .24]. We list the top twenty performances by date. Thus if two performances are the same, the most recent performance is listed first. In all events performances drop off the list as newer performances with the same time/distance are made. We make every effort to be accurate. However, if you find a name not spelled correctly or a performance that is wrong or is not placed correctly please contact us so that we can correct the error.